Register now for the November 27th workshop! 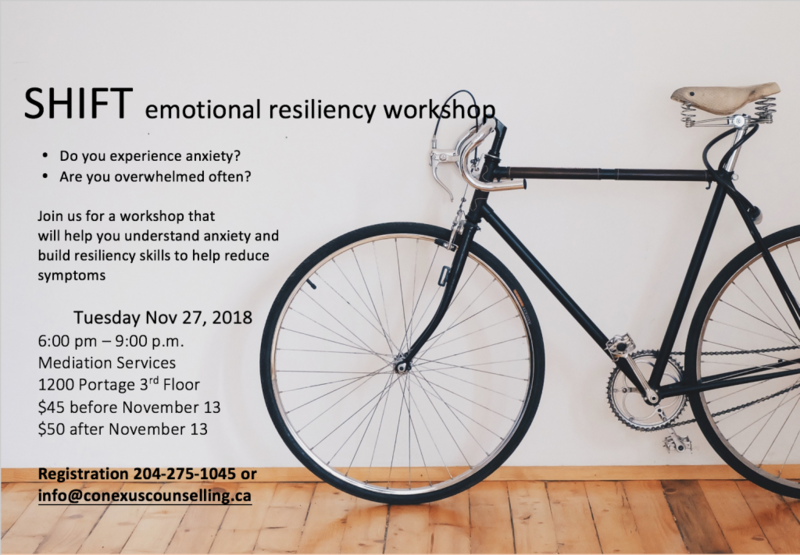 SHIFT emotional resiliency workshop is an introductory seminar for those learning to deal with anxiety. We will review the physiology of anxiety, and provide you with some strategies to better deal with anxiety. We will give you a chance to practice a few of them, and provide you with some resources to take home. You might be suffering with anxiety a little or a lot--we welcome all. It'll be good to know you are not on your own. We recognize that it can create anxiety to attend a workshop. We'll have some good snacks, some coffee and juice to give you something to hold and do. You can participate in a way that feels comfortable--choosing in to join conversation, or just being an active observer. Let us make it possible for you to walk in the door--and if your heart is pounding when you come in--that's OK! Bring a friend or relative...sometimes it's easier not to come on your own. COST: Register early! $45.00 prior to November 13. $50.00 after November 13. LOCATION: 302-1200 Portage Ave. (Parking on the side streets. Go to the third floor via the elevator and turn right...go in the door that says "Mediation services" and go through the door. We'll be there waiting to welcome you. Sign up using the following form. We'll contact you to finish getting the details, including payment. We welcome your email…and we will take care to honour your courage. Let us know you want to come and our client care staff will be please to complete the registrations. Please ensure that you push "Send Message" at the bottom of the form. If you don't hear a reply within one business day, then somehow we didn't get your message. We always reply within one business day.